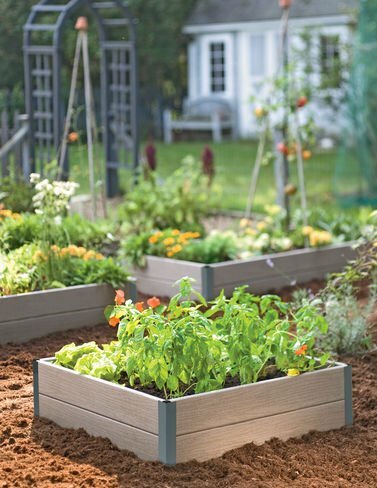 Raised garden beds are the easiest way to grow your own fresh vegetables. No digging, no weeding — just lots of delicious food! Our Forever Raised Beds set up in minutes and last for decades. Made from a composite of recycled wood and plastic, they have the attractive look and feel of silvery aged cedar, but will never splinter or rot. Aluminum brackets keep the sides straight and true. Generous 10-1/2" depth helps retain moisture and provides plenty of root space for everything from salad greens, peppers and tomatoes to carrots, squash and even potatoes.